First and foremost, I want to thank the game of basketball. This great sport has brought joy to untold numbers of people, including myself. When I was four years old, I got my first basketball. At nine, I entered a youth sports school in Xuhui district (in Shanghai). I joined the Shanghai Junior Team at 14. And when I was 16 years old, I put on my dad’s former number, and joined the Shanghai Sharks senior team in competition. Basketball has allowed me to follow in my family’s footsteps. Whenever I see the joy and satisfaction in my parents’ eyes, I feel a strong sense of pride. I was also fortunate to win a CBA Championship with my teammates for the city of Shanghai in 2002. From that moment on, basketball has connected me with this great city. During that same year, I entered the NBA. Basketball has led me to a bigger and broader stage to showcase my abilities. It’s a dream for many to play for the National Team. So in fulfilling my dream, I am especially grateful of the opportunity to play for my country for so many years. And because of basketball, I have found the love of my life Ye Li, and a lifetime of happiness. Basketball has given me so much and for this, I want to thank the game of basketball. I also want to thank life. No matter if it’s my beloved basketball or other endeavors. It is all just a part of life. I believe life is like a guide. If you follow him faithfully, he will open doors to wonderful worlds for you. Today, I am retired from basketball, and one of those doors is closed. But elsewhere, another door is opening and outside that door is a new world waiting for me to experience and explore? Even though I am leaving the basketball court, I will not leave the game. The Shanghai Sharks team is how my professional life will continue. I am continuing to learn about managing and running the team and will do my best to bring honor and glory to my hometown and to Chinese basketball. I will continue my philanthropic work. 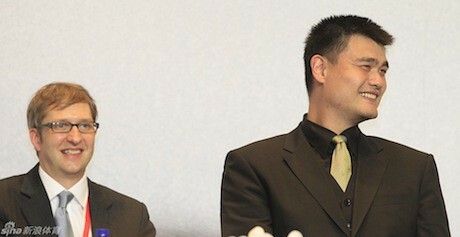 The Yao Foundation has been established for three years now. I will work with the foundation to influence more people to join philanthropic activities to help others. I wish to meet and work with new and old friends on projects of mutual interest. I believe that through meeting and working with people from different fields and professions, I can gain new knowledge and new understandings. Life has guided me from Shanghai to China, from Chinato the world. I want to thank life and continue to repay my good fortune by embracing and treasuring every moment. Finally, I want to thank the many special people in my life, my family and my friends. I have a long list of people. But due to time, I can only mention a few here. I am missing a lot of names, but I hope my friends will understand. First, I want to thank my family. My parents were my first teachers in life. My wife, Ye Li is my best friend and best listener. Our lovely daughter, Amy, is our new hope for the future. I also want to thank my coaches. They educated and guided me and have watched over me every step of way. I want to thank my first coach Li Zhangming, coaches LiQiuping, Wang Qun, and Wang Chongguang from the Shanghai Sharks, coach Ma Lianbao with the Chinese National Junior team, head coaches Wang Fei, Jiang Qingquan, Del Harris, and Jonas Kazlauskas from the Chinese National Team, and head coaches Rudy Tomjanovich, Jeff Van Gundy, Rick Adelman and Tom Thibodeau with the Houston Rockets. I also wish to thank officials and organizations that have helped me, especially officials from National Sports Administration, city of Shanghai, China Basketball Association, Shanghai Sports Administration, the Shanghai Media Group, and Shanghai Oriental Basketball Club (Shanghai Sharks). It is through their care, interest, support, and encouragement that allowed me to develop and reach where I am today. I want to thank the NBA and the Houston Rockets. Their understanding and support helped me overcome the language and cultural barrier to play in the highest level basketball games in the world. Next, I want to thank all of my teammates and opponents. First is Liu Wei. We grew up together, played and battled together, and those experiences are some of my most precious memories in life. I also want to thank Wang Zhizhi and ShaquilleO’Neal. They were the benchmark players that I was chasing after. They motivated me and pushed me forward, and without them, I would not be the player I am today. I want to thank Fan Bin, my friend and mentor on the National team; Shen Wei, Jia Xiaozhong, Zhang Wenqi, Li Nan, Mengke Bateer, Yi Jianlian, Steve Francis, Cuttino Mobley, Tracy McGrady, Shane Battier, Dikembe Mutombo, Chuck Hayes, Luis Scola, Aaron Brooks, Kyle Lowry, as well as all of my former teammates from the Xuhui District Youth Sports School, the Shanghai Sharks Junior team, the Shanghai Sharks, the National Junior Team, the Chinese National Team, andthe Houston Rockets, and of course all my opponents in CBA and NBA who I played against. The time we spent sweating and competing will forever be etched in my memory. 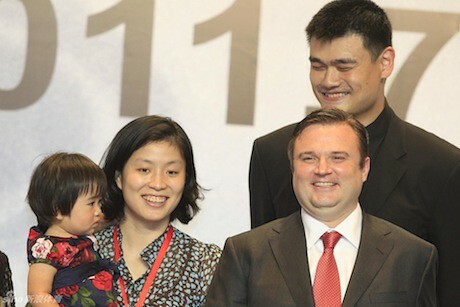 I also want to thank my management team, “Team Yao”. I want to thank Erik Zhang, Lu Hao, John Huizinga, Bill Duffy, Bill Sanders, Huang Xiaopeng, Li Lu, Ilana, and Larry Zhang, as well as everyone who has worked behind the scenes. I will never forget everything you have done for me over the years. I’d also like to take this opportunity to thank my friends in the media, my sponsors, and partners. I am honored to have worked with all of you. Finally I want to sincerely thank all of the fans. Those who liked me or those who didn’t, those who are in China, or those abroad, I want to thank everyone who has watched me over the years. It is through everyone’s support that has allowed me to play with confidence and courage; and through everyone’s criticism that has helped me improve in areas that I was lacking. For those I have mentioned, and for those I have not, you are all in my heart. In short, I want to thank everyone who has accompanied me these years. And I will continueto do my best and will continue to be with everyone. Finally, I want to thank this enlightened time of progress that we live in: giving me the opportunities to realize my dreams, and find my self-worth. I have once said, when I retire from my professional career, I hope that it is a comma, not a period. Today, that day has finally arrived, but I am not leaving the sport of basketball that I love. My life will continue. I am still Yao Ming and there are still many things that I wish to accomplish. The day of drawing a period is still far far away. I wish everyone health and happiness, I wish the best blessings for my motherland, my home Shanghai, and my second home Houston. And I wish that my beloved sport of basketball will continue to have a bright and prosperous future. This entry was posted on Wednesday, July 20th, 2011 at 9:53 am	and is filed under China, Retirement. You can follow any responses to this entry through the RSS 2.0 feed. Thanks was an amazing career, Yao. 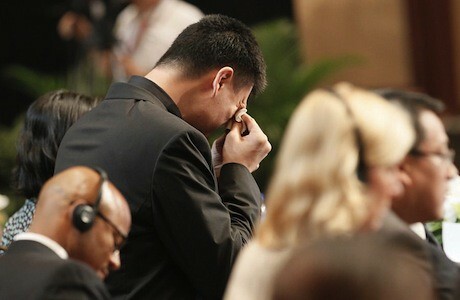 And, thanks to Yao Ming Mania for covering every single minute of it. One of the classiest sports blogs out there. does anyone have a link to the video of the press conference? greatly appreciate it. Hi Ty, thanks for the shout out! That means alot to us! Yao Ming, You have been a tribute to the Chinese sports and we are really proud of you for serving our nation in China and abroad. You are a big source of inspiration for all the athletes looking to enter the Olympics as well. Cheers for you, man. Your fans miss u already….